Last Friday I had an interview as part of my application for funding from the Churchill Trust for a four-week overseas tour to study blackwood cultivation, research and farmer experiences in New Zealand and Chile. It all started last year when I was invited to join the New Zealand AMIGO tour of Chile. The New Zealand blackwood growers group is organising a week-long tour of blackwood cultivation and research in Chile in October 2012. Being short of money it seemed unlikely that I would be able to attend. Then in February this year I happened to notice an ad in the newspaper asking for applications for funding from the Churchill Trust. With the activity surrounding the blackwood growers coop, this seemed like a perfect opportunity to combine some fact-finding, the Chile tour, and help promote the coop proposal. AMIGO Chairman Ian Nicholas helped with the two week itinerary in New Zealand. The eight members of the interview panel seemed very interested in the proposal and my planned overseas trip, asking many searching and pertinent questions. The 30 minute intensive interview certainly got my adrenalin pumping. My itinerary involves two weeks touring New Zealand visiting blackwood growers, and meeting members of AMIGO. I will also make two presentations of the results from my PhD research to foresters, students and farmers. From there I join the AMIGO tour to Chile where we will visit research centres and various blackwood trials. The final leg of the tour involves a week in Hawaii looking at Acacia koa. So what is Acacia koa? It is one of Hawaii’s main forest trees, endemic to the islands. Just like blackwood it has a long heritage as a premium timber species, and was very important to the native Hawaiians before European contact. 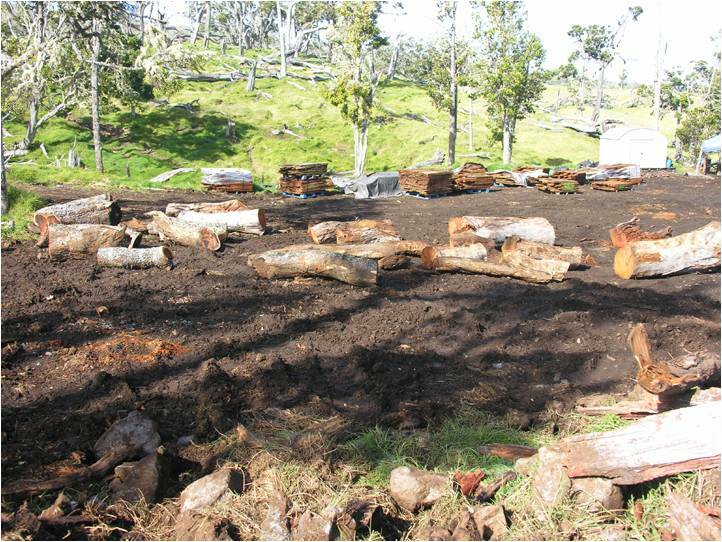 Much of the koa forest has been cleared for farming, with only a small amount of wood now harvested from salvage operations from private land that look more like firewood operations than valuable timber harvesting (above image, Nick Dudley HARC). But farming in Hawaii is changing and there are moves to restore some of the koa forest and provide future supplies of this valuable timber. There is a lot of research going on. Dr. James Friday from the University of Hawaii, Forestry Extension Service has invited me to visit. I will find out in June if my application for funding was successful. If successful I will come back with greater understanding of both the technical aspects but also of the human factor – what motivates farmers to want to grow trees, their experiences and frustrations. I will hopefully have lots of images and stories to post on the blog and use to promote the blackwood growers coop.